For this special feature in our ongoing Field Notes series (where creators from all disciplines shine light behind the curtain at their daily practice — revealing the often messy, sometimes frustrating, surprisingly beautiful life along the way) the OS is excited to have composers Todd Lerew, Kristina Warren and Michael Laurello, finalists in the 2014 American Composers Forum National Composition Contest. Lerew, Warren, and Laurello will each share their process notes with us as they develop new work from now through July, when the pieces will premiere at the Sō Percussion Summer Institute at Princeton University. Get better introduced – and listen to samples from these innovative new composers — at our series introduction, HERE. Todd Lerew kicked off this series last week with his Field Notes: Thoughts on Musical Failure. Today, we have Kristina Warren, blowing your mind with composition drawing from Korean P’ansori, Colormapping, and more. GET INSPIRED. Take notes! Hello! 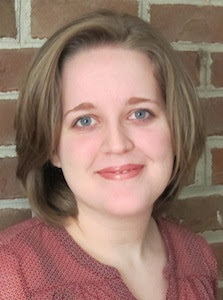 I’m Kristina Warren, a composer and vocalist currently based in Virginia. I’m thrilled to have been chosen as one of three finalists in the 2014 American Composers Forum National Composition Contest, which gives me the wonderful opportunity to write a new piece for Sō Percussion, to be premiered this July. This is the first in a series of posts in which I’ll write about my process and influences for the piece. In this post, I’ll experiment with a somewhat fragmented writing style, as this relates to what I hope to compose for Sō. Is it enough to write a really good sounding piece? I’m interested in graphic and color-based scores. Pogpo was my first color-based score, and it was inspired by p’ansori, an old musical style originating in Korea. I love p’ansori’s sonic nuances. In Pogpo (2012, electric guitar quartet, c. 5’), I map each of six colors to either two or four possible pitch classes from which performers can choose (I like the slight dodecaphonic redundancy), and I specify many upward and downward pitch bends. I also use loop- ing of color sequences, but there is perform-er choice involved in color-to-pitch mapping, separate instances of a color loop could sound totally different. Dither performed the piece in February 2013; they made excellent timbral and pitch choices, and generally just rocked. Since Pogpo, I’ve composed Love is Not Love (solo bassoon). Since Pogpo, I’ve composed Rivulet (open instrumentation). 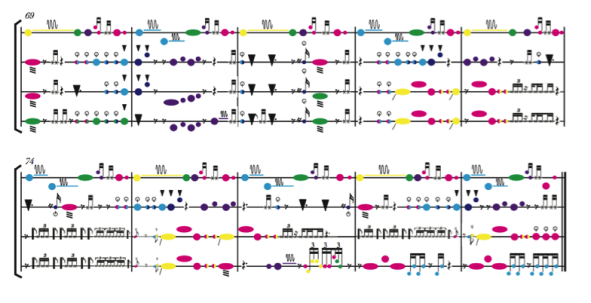 These pieces use color-to-pitch mapping, similar to Pogpo. Since Pogpo, I’ve composed Adelaide (three sixxen and piano). 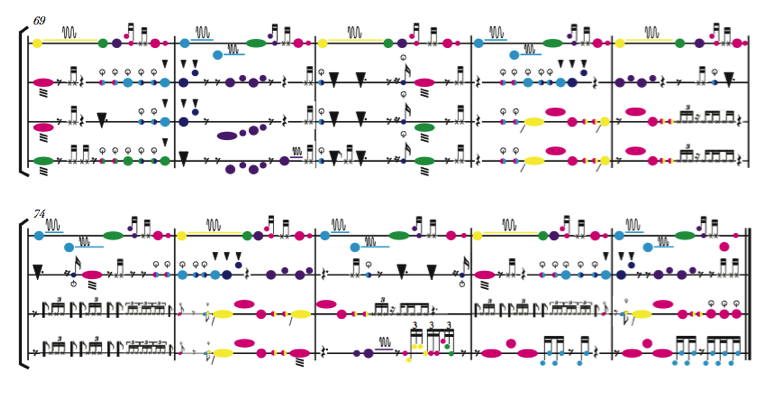 This piece maps color to various possible rhythmic fragments. How do you gradually change timbre in a percussion piece? 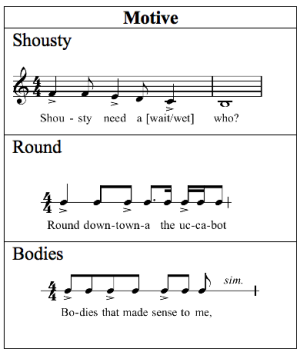 How do you make timbre a formal feature in a percussion piece? I like composing for voice. I grew up singing, formally and informally. In college I sang Renaissance polyphony. Last year I met Shousty. I composed Folk Study No. 3 (Shousty) as part of a collaboration with Kim Brooks Mata, the Head and Artistic Director of Dance at the University of Virginia. She wanted music to accompany her dance-for-film piece which dealt with interpersonal relationships and foreground vs background. I wrote a tape piece that uses looping and textual (non)sense in an attempt to question (semantic, vocal, embodied…) reality. For me, musical generation is often subconscious. Motives occur to me when I’m showering, watching a movie, or almost asleep. But composing is also giving some (read: any) kind of reason for it. Why choice and why color? I want to enfranchise talented, intelligent performers in the music creation process. I want to validate different (non-hegemonic, non-concert hall) kinds of listening. In “Summertime Clothes,” [Animal Collective] I love the interplay between Panda’s and Avey’s voices. I love the coexistence of gnarly timbres, bouncy mood, and smart arrangement. Color-based performer choice questions the categories of composer and performer, and goes against the score-centricity and composer-centricity that have become ossified in so much Western music. Popular music is a valuable influence for many reasons, including that (1) it treats the sound, not the score, as the definitive document; and that (2) it provides a useful paradigm for understanding listener experience and innovating in this area. KRISTINA WARREN (b. 1989) is a composer and vocalist who holds a B.A. in Music Composition from Duke University and is currently pursuing a Ph.D. in Composition and Computer Technologies from the University of Virginia. Recent works include Three Sonnets of Elizabeth Barrett Browning (soprano, electronics), Folk Studies No. 1 (Up in the A.M.), No. 2 (Vimeda Sakla), and No. 3 (Shousty) for voice-based electronics, and Pogpo (electric guitar quartet). Warren’s research interests include voice, electronics, and questions of aleatoryand performance practice in conjunction with various non-Eurocentric musics, such as folk music and Korean p’ansori. Warren’s compositions have been performed across the US and in Europe, and she has been fortunate to study composition with Ted Coffey, Judith Shatin, Anthony Kelley, Scott Lindroth , and John Supko.